Taxxis is seen here riding a slightly resculpted Deth in a whole new way from the original, trollsurfing style. 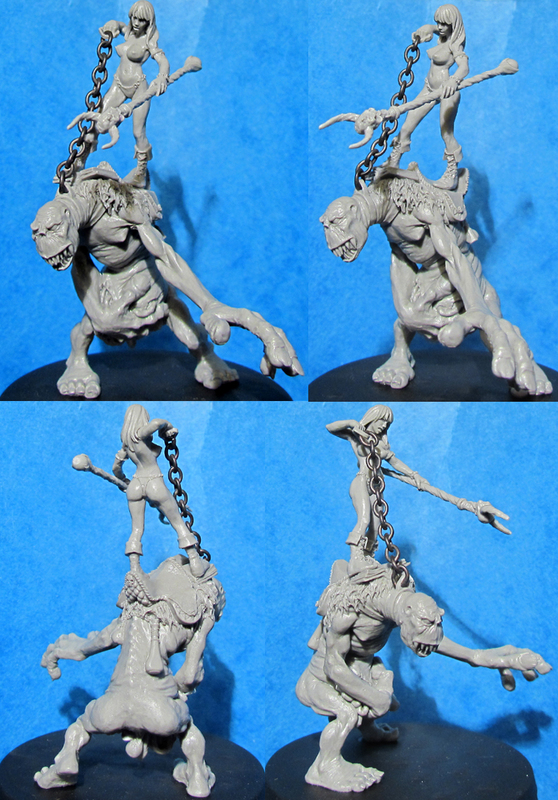 Armed with a death's head staff and a, partly disembowelled, angry undead troll. This is the latest in a fairly extensive line of variants, it might even make our resident, barely-clothed, necromancer (Is there a necromanceress type word?) our most sculpted character. This is a Limited Edition Resin 'Master Casting' of Dynamic Deth & Taxxis, the standard white metal version (when available) can be found below. These Master Castings are strictly limited to however many we can get out of any Master Moulds before they deteriorate. These are about as limited as anything we've made and are the closest thing to Kev's original green as possible so hold the highest level of detail available.